The war in the Pacific between Imperial Japan and the United States and its Allies was what one historian noted was a ‘war without mercy.” Unlike the war in Western Europe where western nations fought a war of political ideology or the Eastern Front where the Nazis and Soviets fought a war of annihilation the war in the Pacific was a war of opposing cultures and races. It was a tribal war fought on a massive scale. It was a war that pitted culture against culture, the West against the East in a war that pre-figured Samuel Huntington’s “Class of Civilizations.” The Japanese motivated by the spirit of the Samurai, the Code of Bushido and their own understanding of the “Master Race” had embarked on a war of aggression as early as 1942. The west often seeing all oriental races as inferior to Western culture depicted the Japanese as apes and monkeys. The clash of cultures as well as economic and geopolitical factors brought about a war that saw acts of corporate and personal brutality that are hard to imagine to those raised in the liberal Western mindset. The battles fought and the manner in which the war was waged was even more brutal than the war between the Soviets and Nazi Germany on the Eastern front. The Japanese seldom surrendered and treated their Allied captives as warriors who had dishonored themselves. 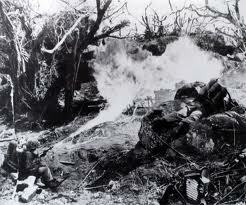 Likewise most Japanese resisted to the death and the Americans were glad to oblige them that favor. The attack on Pearl Harbor was a Defining Moment in U.S. History. These articles were originally filed under their own page, but to clean up the site I have included them under this page. This will be updated each time I publish a new article on the subject. would like any info on darrell d woodside amm1/c nap at battle of midway june 4 1942 was in VT-8/ had his gold wings in 1938 from pensacola i don’t know. AMM1 Woodside was killed during the battle piloting his aircraft against the Japanese carriers. He was Posthumously awarded the Navy Cross: The citation follows. The President of the United States of America takes pride in presenting the Navy Cross (Posthumously) to Aviation Machinist’s Mate First Class Darrell D. Woodside (NSN: 3211769), United States Navy, for extraordinary heroism in operations against the enemy while serving as Pilot of a carrier-based Navy Torpedo Plane of Torpedo Squadron EIGHT (VT-8), embarked from Naval Air Station Midway during the “Air Battle of Midway,” against enemy Japanese forces on 4 and 5 June 1942. In the first attack against an enemy carrier of the Japanese invasion fleet, Aviation Machinist’s Mate First Class Woodside pressed home his attack in the face of withering fire from enemy Japanese fighters and anti-aircraft forces. Because of events attendant upon the Battle of Midway, there can be no doubt that he gallantly gave up his life in the service of his country. His courage and utter disregard for his own personal safety were in keeping with the highest traditions of the United States Naval Service. He gallantly gave his life for his country.